The Great Gatsby theme is a popular choice for parties & weddings this year. I’ve seen it on Pinterest boards pinned for sweet sixteens, New Year’s Eve Parties, Birthday Parties and Weddings. Here is an example of a party/wedding place cards Jacques printed with Digital Calligraphy in TR Paragon on top of the gold shell design of this card in black ink. The matching Gatsby Style Invitation is also encrusted with gold upside down shells. The lettering on the invitation is in combination gold and white ink, it’s offered by our Arabella Designers available at Hyegraph. 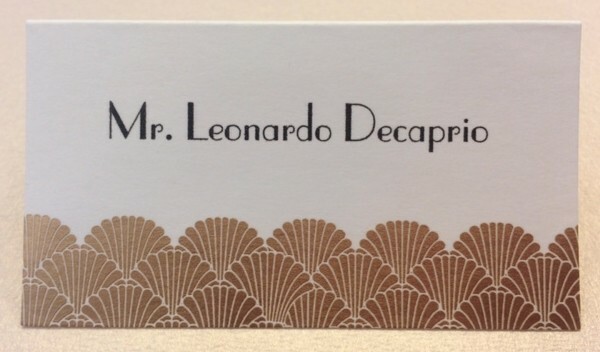 The above example of a Great Gatsby Place Card illustrates TR Paragon font style which is a popular choice by our brides. The ink color is Black on top of matte cream stock. This personalized place card enhances the theme of the party/wedding and adds to the details of the event making your guests/wedding attendees feel special. 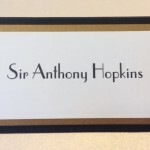 Adding your guest’s name to the place card ensues that you have taken the extra step and time to make them feel welcome to your special day. 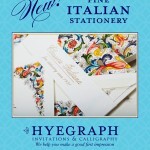 The Price for the Place Card/Wedding Place Card is $3.00/each. We also recommend The Great Gatsby Style Table Card which also adds an element of elegance and flair to your Party/Wedding. The Price for the Table Number Card is $2.50/each. You’re also welcome to check out our paper selection and wedding invitation on our Shop ONLINE Site. Create your unique invitations for your next event by booking an appointment with us!